This afternoon Jasper and I made a trip to our local library and picked up a few books for each of us. 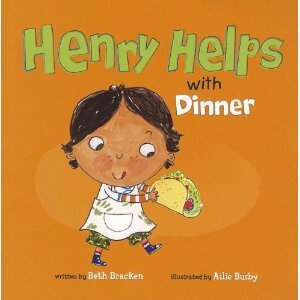 Back home, we read Henry Helps with Dinner for the first time. It’s a sweet and simple story about a little guy helping to make dinner on taco night. He shreds the lettuce into little pieces, smooshes avocado for guacamole and puts a serviette at each place at the table. There’s no fanfare, just a kid participating in the family, and Henry’s only reward is getting to sit down to share a meal with his family. Amazing, right? Forget Zumba baby classes, religiously reading 15 minutes a day, and Baby Einstein and all the rest of the stuff that society tries to convince us are necessary (to purchase) for parenting. Washing, sweeping, setting the table. That’s the secret to raising a smart, happy, engaged human. As it happens, Jasper helped me to empty the dishwasher for the first time today, picking out the cutlery and handing each piece to me to put away in the drawer, one by one.